“By their affiliations, you shall know them” to restate a familiar biblical quote. Many genealogical experts urge us to look at the groups our ancestors joined to learn more about them. One of the potentially richest sources of information for genealogists is the church where our ancestor worshipped. The records created by churches sometimes include, and may go beyond, the sacramental records of baptism, communion, confirmation and marriage. As I have mentioned before in this blog, serendipity along with the steady mining of information from a variety of sources can sometimes result in unexpected and amazing finds. Last year I became aware of the Chicago Genealogical Society On the CGS website, I clicked the publications tab and found the listing of the contents of copies of the quarterly journal of the Society, The Chicago Genealogist, going all the way back to 1969. But the best news of all is that the Newberry Library in Chicago has digitized all the copies of this journal. It is a two-step process to find articles of interest in The Chicago Genealogist. First, you look at the list of articles on the CGS website. When you find an article of interest (be sure to note the date, volume, number), you search for it on the Newberry’s digitized collection. From this page, you can click on “Advanced Search” at the top and search for the exact volume. As I looked down the list of names of parishioners, I saw some of my target surnames (J. Carney, Patrick Kearney, J. Duffy), as well as names from their collateral families (Anthony Dinan, Bernard Cosgrove, John Cosgrove, T. Cosgrove). This find was exciting because I had been stuck in my Irish paternal great great grandparents’generation: my great great grandfather John Carney/Kearney and my great great grandmother Mary Duffy. I had found little information about them. They are identified as my great grandmother’s (Mary Carney/Kearney Kries Lauer) parents only on her second marriage application. I have found mention of people in John’s and Mary’s close social circle (collateral families) on baptism records. Julia Mercer Cosgrove is listed as a baptismal sponsor for Patrick William Kearney, the son of John Kearney and Mary Duffy. In the next generation, Catherine Sweeney Brookins Dinan and her son, Charles Dinan, were baptismal sponsors for Henrietta Kries, the daughter of Mary Carney/Kearney Kries and Henry Kries. Another caveat to researchers that genealogy experts put forward is that if at all possible, a researcher should always go back to the original source. You never know if mistakes were made by an indexer or transcriber or if information was left out. 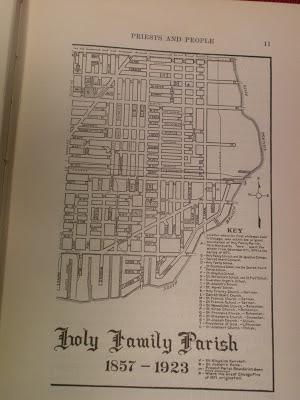 So I needed to consult Brother Mulkerins’ book on the first parish of my Chicago ancestors. I went to the University of Illinois Chicago Campus and searched for the book on the UIC library page. I found that there were two copies, one in Special Collections which was non-circulating and one in the stacks. I telephoned the library just to be sure the latter could be requested through Interlibrary Loan (ILL). Fortunately, I was able to obtain this treasure through my local library’s ILL program.You can also read Holy Family Parish online at archive.org. 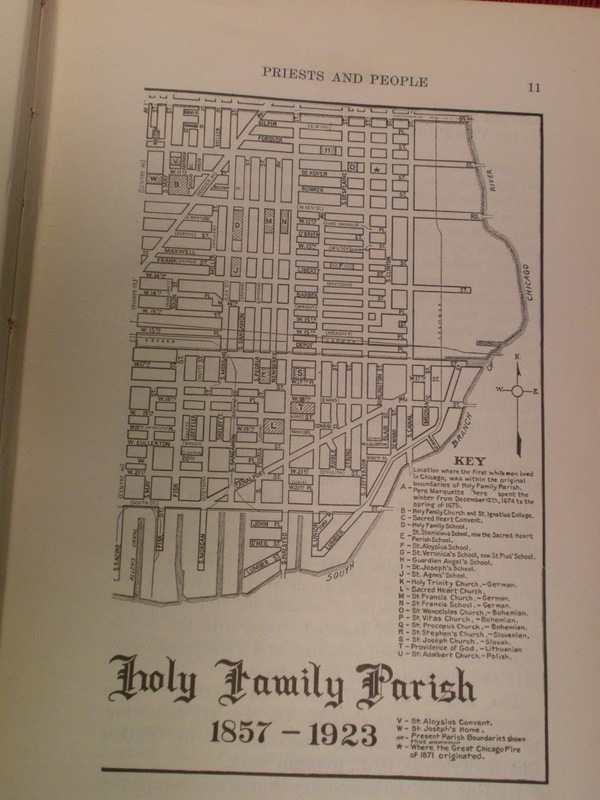 One of the key elements of the book is the parish map that is included. I was actually able to locate the area where my great great grandparents lived (Halsted and Maxwell/Hastings) on this map. What the land around Holy Family Parish looked like when the church was built in 1857. 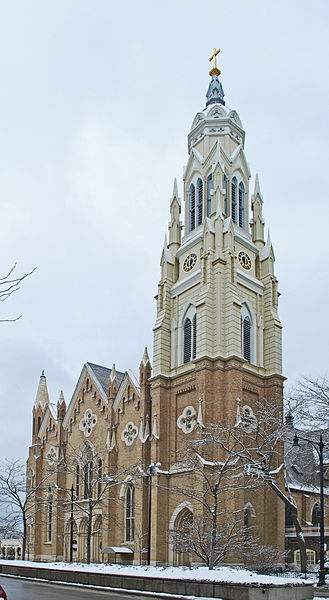 Why so many parishioners were included as contributors to the altar society drive. What the neighborhood was like – what kinds of commercial establishments lined the streets. “Even in those early days it had already become a matter of quite general knowledge that the establishment of a Catholic Church…generally had the effect of drawing people to the vicinity….In an incredibly short time there were numerous families living near the site of the church, and there were numerous additions to the industrial plants.” 2 And why was this? Between pages 725 and 747, Father Mulkerins takes us on a walk through the neighborhood and describes the commercial establishments, other than grocery/saloons, including: drug stores and shoe stores, bakeries and undertakers, coal businesses and hay stores, candle manufacturers and hardware stores, house movers and dry goods stores, meat markets and ice cream stores, hatters and leather stores, and tobacco stores and livery businesses. Yes, Holy Family Parish was a magnificent discovery. I learned that before my great grandparents attended St. Patrick’s Church, their parents were members of Holy Family Parish. 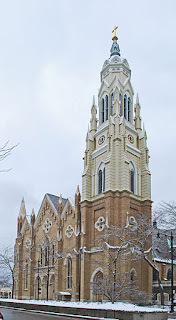 I had the opportunity, one that is so often out of reach to genealogists, to “tour” the neighborhood where my people lived, shopped, worked and worshipped. 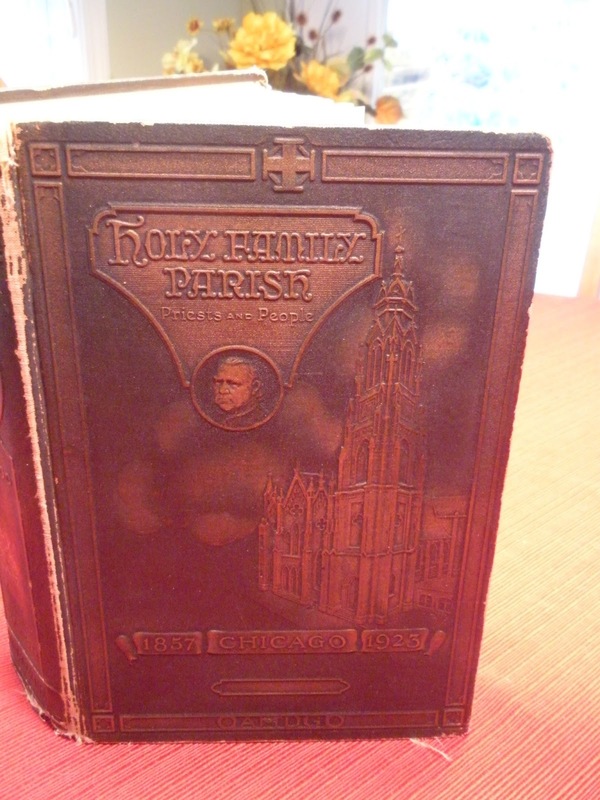 Thomas M. Mulkerins, Brother, Holy Family Parish, Chicago: Priests and People (Chicago, IL: Universal Press, 1923), 718.